27 shots from Gust's new PlayStation action RPG. Gust has released the first official details and screenshots of Yoru no Nai Kuni, its newly announced PlayStation 4, PlayStation 3, and PS Vita action RPG from Deception and Fatal Frame‘s Keisuke Kikuchi. The battle against the monster leader, known as the Ruler of the Night, ended in human victory. However, the polluted blood from his fall scattered and left behind a root of evil. Those that bathe in its blue blood change form and become beings known as Jayou—creatures that take away the night from the people. Since then, the people of this land go about their doings while the light shines, as the Jayou come out when darkness falls. A land that never sleeps, it’s become known as the “Land Without Night.” Bathed in blue blood, a girl cursed with the abilities of a “Bloodsucker” lives for those of the Land Without Night, and fights alone as the night’s sacrifice. This Land Without Night does not exist on maps. This is the story of two girls’ love scattered in history. A story of life and battle not told by anyone thereafter. A story based on this true love, both sadder than anything else and more beautiful than the moon—. Arnas (voiced by MAO) – A holy knight that serves the curia. She once touched the blood of the Ruler of the Night, and has become half-human, half-monster. 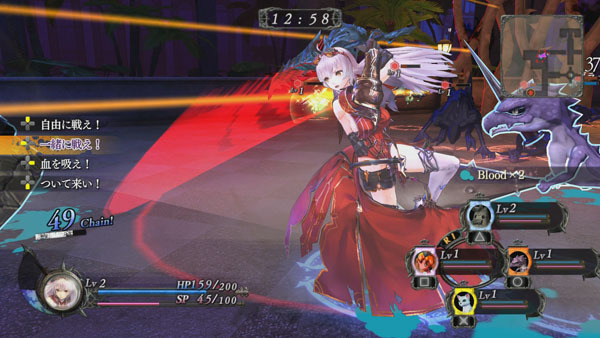 With her bloodsucking ability coming from her half-monster side, she fights using a demon sword formed from her blood. She is a quiet and calm girl at first glance, but has strong passion hidden within. The saint who carries the burden of devoting her life to seal the Ruler of the Night. And the holy knight protecting the saint from Jayou and delivering her to the Ruler of the Night. Arnas is newly dispatched to Rusewall Island, where she is reunited with her close friend Lyuritis. It’s their first meeting since leaving boarding school, so the two girls do not hide their happiness. But their encounter was no coincidence. A holy knight and a saint. In reality, their bonds will be torn. Does Arnas protect the life of her close friend, or sacrifice the saint’s life to the Ruler of the Night? For these girls in conflict, their fated decision draws nearer at every moment. Arnas can form a contract with familiars, or subordinate demons, known as “Servans.” During battle, she can summon them to fight. Attacker Type – This type specializes in continuous attacks in accordance with Arnas’ commands. Support Type – This type specializes in HP and status ailment recovery, as well as applying buffs. Demons grow as they fight alongside Arnas, with more traits coming out as they grow. You can train your demons evenly, or pick a favorite. It’s up to the player.